← Beaver on the lawn! 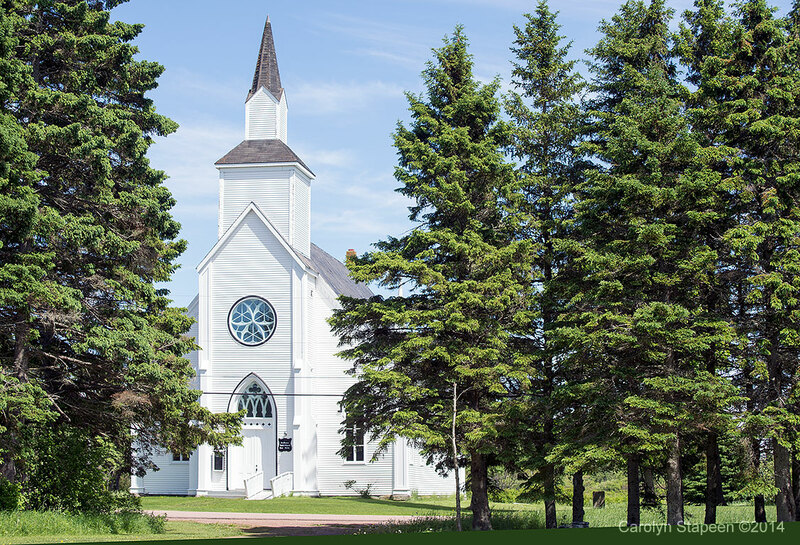 When you drive around parts of Canada that were among those first settled, you will see at least one wooden church steeple in each community. And when you are driving through areas in which nothing lives between communities and appreciate that when those first settlers were building their homes and commuities there were no paved roads that would allow vehicles that could travel 60, 80, 100km/hr between them and nearby towns and villages. They were isolated, dependant upon themselves and their neighbours.. Whatever your sentiments about religion, churches were ways in which people living by their own hands, in isolated pockets, could base their communites around. This is St. James Church in Baie Verte, New Brunswick, built in 1883. The first church in the area was built in 1818. This area was first settled in the 1690s by Acadians. After the explusion of the Acadians in 1755, New England Planters came in, followed by other groups and, eventually, returning Acadians. There are lots of reasons to stop around the area and those will appear in later posts. This entry was posted in History and tagged Nova Scotia. Bookmark the permalink.